Anyone who knows me even a little bit knows that I LOVE to read. When I was a kid, my mom would take me and my brother to the library, and we would come back with STACKS of books. The librarians were always shocked when we returned again the very next week for another massive stack. I was very systematic about it: starting at the first shelf, I would pick out any and every book that looked interesting, making my way through as many shelves as possible by the end of the summer and making sure I didn’t miss a single book. My love for reading is also a huge part of my relationship with my dad. My dad has always been a voracious reader – just yesterday he stayed up until 3 in the morning catching up on his many magazine subscriptions – and I remember many Sunday mornings, reading the newspaper (me with the comics section of course) with him at the kitchen table. One of our favorite activities is going over to the local Barnes & Noble, picking out a stack of books & magazines, ordering a coffee, and settling in for a good few hours of uninterrupted reading. To this day, I still love to read. 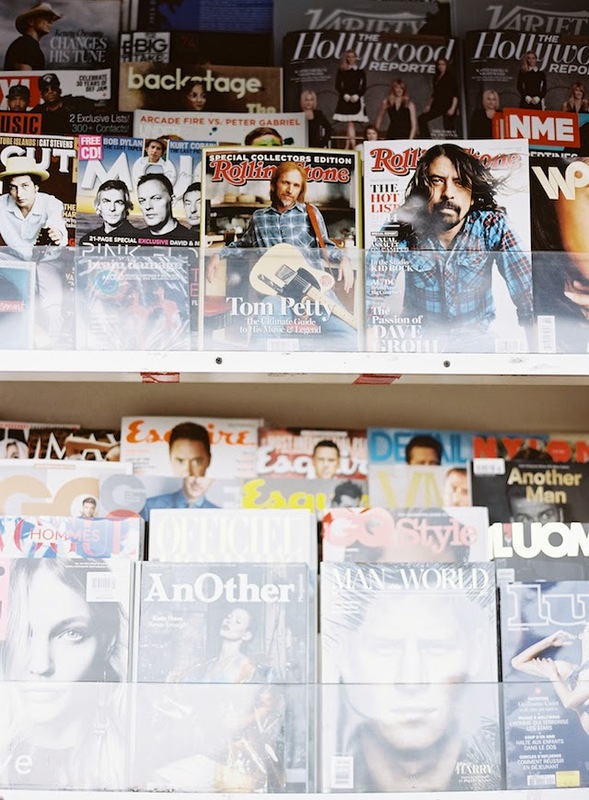 Fiction, non-fiction, blogs, news, and one of life’s greatest pleasures, magazines. I’m all for scrolling through the latest editorials online, but there’s just something to be said for flipping through the hard copies… the weight and feel of the pages, the ink and font used, the smell… happy sigh. There’s nothing quite like it. This magazine stand is walking distance from my apartment, and I can’t walk by it without pausing to peruse. And if I ever need a pick-me-up, a magazine (or a book at the next-door Skylight Books) is sure to do the trick. You should read The secret history by Donna tartt!